The Puente Hills Corridor Native Habitat Preservation Authority invites local residents to participate in a leisurely guided hike in the Puente Hills from 8 to 10 a.m. on Saturday, Aug. 29. The tour begins at the Arroyo Pescadero Trailhead, 7531 S. Colima Road in Whittier. Participants will be guided on a leisurely hike and learn about the plants, wildlife, history and restoration of the Preserve. This is open to all ages. For information, call Helen Cohen at (562) 945-9003 or email hcohen@habitatauthority.org. 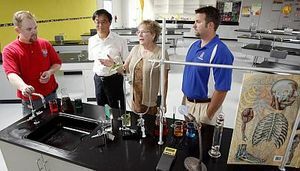 Mark Hughes, science chairman at Los Altos High School, discusses new science labs with Joseph Chang and Anita Perez, the president and vice president of the Hacienda La Puente Unified School Board. Looking on is biology teacher Sean Kane, who will enjoy a new lab. Read all about the new science laboratories in the Hacienda Heights Highlander. Got the end-of-summer blues? The Hacienda Heights Library will help kids get psyched up for school at 1 p.m. Thursday. A double-feature afternoon will feature two funny school-themed movies guaranteed to make kids want to grab their backpack and break out the books. The library is at 16010 La Monde St. For information, call Karen Noyes at (626) 968-9356. For one morning last week, the courtyard of Giano Intermediate School in West Covina was transformed into a shoe store, the kind of shoe store some women dream about. 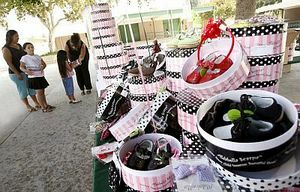 Shoes that usually grace the shelves of high-end boutiques were handed out for free to the waiting arms of elementary and middle school girls in the Rowland Unified School District. They sat on cement benches trying them on, delighting in the colors and designs, and planning what they would wear with them on the first day of school on Aug. 24. For many, they will be the only shoes they get this year. And for their parents, the gift provided much-needed relief in tough economic times. The giveaway was part of a movement by a pair of West Covina sisters and shoe designers to provide shoes to children across the country living in poverty. The Steinmetz Senior Center in Hacienda Heights has a new walking club that meets from 7:30 a.m. to 9 a.m. every Monday, Wednesday and Friday. The class began in late July and welcomes new walkers at any time. Participants should bring a water bottle. In addition to starting or continuing a healthy lifestyle, walkers can earn milestone incentives, set personal goals, and participate in weekly raffles. Clean out that toxic garage! Residents will get the chance to dipose of household hazardous waste and e-waste from 9 a.m. to 3 p.m. on Saturday, Aug. 22, at at Rowland High School. This is a great chance to safely dispose of used motor oil, paint, turpentine, acid or lye-based cleaners. Residents can also get rid of household and car batteries, as well as pesticides and herbicides that can damage the environment if poured down a sink or tossed in the trash. Please leave the waste in their original containers, then place them in a cardboard box, and drive up to the high school. The process takes only a few minutes, without having to leave the car. The e-waste event is sponsored by the County of Los Angeles and the Department of Public Works and Sanitation Districts. For information, call (800) 238-0172 or visit www.lacsd.org. 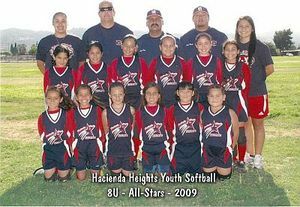 Hacienda Heights Youth Softball’s age 8 and under All-Star team captured the state championship July 19 in San Diego. The team finished its season with a 25-0 record. Team members, pictured from left, include: bottom row, Janelle Meono, Sarah Duran, Danielle Michaels, Victoria Ochoa, Samantha Torres and Emily Bracamonte; middle row, Cynthia Perez, Faye Ruiz, Melanie Garcia, Savannah Diederich, Brianna Santos and Midajah Ochoa; top row, coaches Bianca Mejia, Angelo Michaels, Tony Bracamonte, Manuel Ruiz and Jessica Bracamonte. Liz Mohler, a career coach and corporate management consultant, will discuss job hunting techniques and resume writing from 4 p.m. to 5 p.m. Tuesday, Aug. 25, in the Rowland Heights Library. If any one needs help, she will also review resumes individually. The library will also hold a book sale in the lobby from 10 a.m. to 4 p.m. on Saturday, Aug. 22. They will have children’s fiction and non-fiction books, young adult, adult fiction and non-fiction books, books on tape and VHS movies. The Rowland library is at 1850 Nogales St. For more information, call Rama Shat at (626) 912-5348. 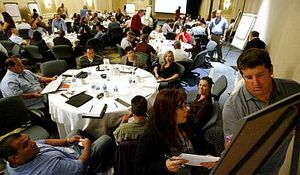 Emergency officials from throughout the San Gabriel Valley gathered on Aug. 6 at Pacific Palms Resort in Industry to explore this scenario, a table top exercise that they hoped would help them prepare their cities for such mass evacuations. “More than 100 people showed up for this exercise. This will give us a huge start in planning for such a large disaster,” said Ken Kondo, spokesman for Los Angeles County Chief Executive Office’s Office of Emergency Management. Wes Elder, a battalion chief with L.A. County Fire, said the Los Angeles Operational Area Alliance received a FEMA grant to begin working on large-scale exercises. Elder noted that coordinating the area’s 88 cities required lots of planning and cooperation. He pointed to the many problems that occurred in the mass evacuation of New Orleans for Hurricane Katrina. Los Angeles hopes to avoid such a disaster by pre-planning emergency response. Read about this important meeting in our story in the Highlanders. Plan to enjoy the next Puente Hills free summer Concert in the Park at 7 p.m. on Tuesday, Aug. 11 at Schabarum Park, 17250 Colima Road in Rowland Heights. The Bobby Perino Orchestra will perform Big Band Music.